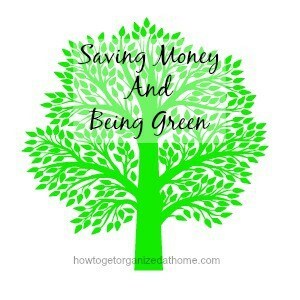 Saving money and being green is easier than you might think. It is about knowing how to save money for yourself and at the same time helping the planet. There are loads of different ideas that you can use which will not only save you money, they can also be green. Often the best money-saving ideas are the ones that are beneficial to your wallet and the planet, making the idea of saving money more appealing to those people who are looking to show they actually care about the planet on which we live. Adjusting your thermostat down in the cooler months will save you money, even if it is just a degree or two. It is the same with your hot water temperature, lowering this by a few degrees will save you money, as your boiler won’t have to work as hard to heat up. The best thing is that the less energy you use the better, the energy you use comes from some resource, whether they are solid fuels, gas or electric, reducing what you use will have an impact on the planet. Drying your clothes outside saves you money; fresh air is free, it can also reduce the amount of moisture in your home and this, in turn, can reduce the mould growth, which many people experience especially on and around windows. The sun and the wind are a natural source and they are not about to disappear or cost you money to use them. Instead of spending money on new products, it is often cheaper if you can rent the item, buy second-hand, borrow or see if you can find one on the free-cycle adverts near you. This reduces the amount of products made, saving the planet from potential pollution and more waste. If you buy an item that you only use once it is a waste of money, you need to either store the item or sell it; chances are you won’t make the money back that you spent. Create your own vegetable garden and grow your own fruits and veg, saving you money on your grocery shopping and saving the environment as you won’t be traveling to buy these goods, you will have them on hand. Making your own cleaning products, which are kind to the environment and are a lot cheaper to make. They do work just as well as the shop bought, high chemical products, saving the atmosphere and your health from the exposure. Saving money is important, it means that you are thinking about how hard you are making your money work for you and this is important. After all, you have worked hard for the money; you might as well get the best deals possible too. Many of the ideas for saving money have another benefit; often they help to save the planet that we live on. This is important because the better we are able to look after the planet on which we live, the better the planet will be able to look after all the future generations. Therefore, saving money has a positive impact on how we live, it can help to protect the planet, too and this is important. Knowing that the actions, which we take, can and will make a difference in the world on which we live, is vital. It takes just one person to change to help the planet and it does make a difference. These are easy suggestions that would easily save money. This is great! I hadn’t thought about how some actions can save both money and the environment – so often environmentalism seems or is expensive, but it doesn’t have to be! Thanks for this! Good tips! I had our thermostat really low last night–on accident! I turned it off yesterday because I had the windows open and I forgot to turn it back on before bed! It was cold this morning!